In the past two weeks, we were so happy to see that many businesses took the advantages of Lunar New Year to approach Chinese living and studying in Canada. While seeing them actively using WeChat, we felt so sorry to the performance of 99% of these businesses. 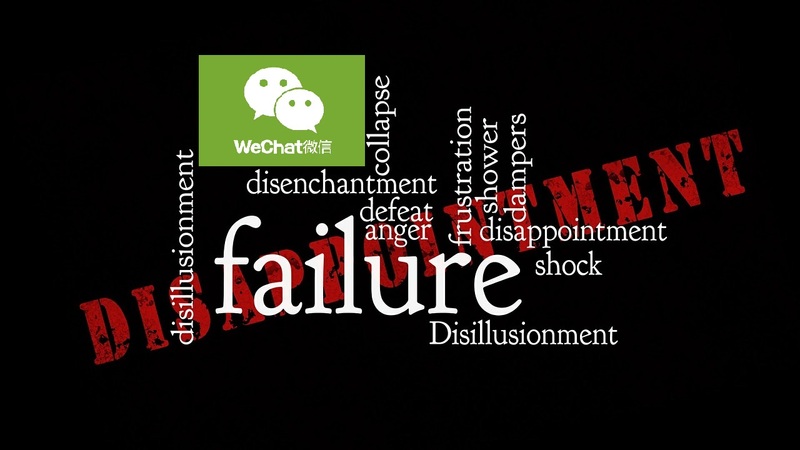 Do you know that over 99% of you are using WeChat marketing in a wrong way? Let’s go through them one by one to see why they don’t work well for you. Tencent, the developer of WeChat, divides its business clients into two groups. One is businesses officially registered an official identity in China. The other is businesses without an official identity registered in China. If you register your business as a foreign company, your followers can only be the users registered outside China. In other words, users now living in Canada but who registered the accounts before they came here are blocked to follow your account. Unfortunately, more than 85% WeChat users in Canada now are those who signed up WeChat when they were in China. Therefore, no strange your account doesn’t work well if you registered it as a foreign company. Birks Group, the jewelry company, is of the type. 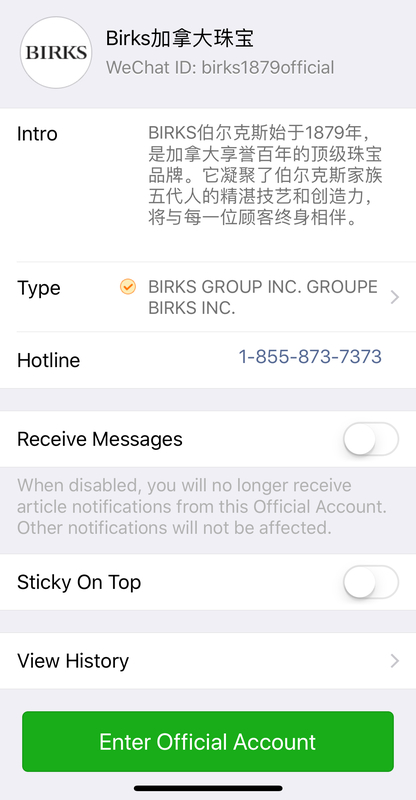 Since its launch last July, Birks had three posts only by now. The first post has less than 800 views until I wrote these. And neither of the other two has 600 views. If you cannot grow subscribers to your account, you cannot make it work, no matter how good your contents are. Though it’s not officially acknowledged by WeChat, many businesses outside China now are using WeChat through agencies in China to make them available to all WeChat users. Holt Renfrew, Buick Canada, and almost all local Chinese media are of the type. It gives these businesses the privileges to use all features of WeChat. Meanwhile, however, it also brings noises to these accounts. The followers of these accounts may come from other regions and you cannot identify them if you don’t know how to do it. By tracking posts and comments on certain accounts, we can tell that almost all of these accounts have more than 15% of followers not living in their target markets. Messages to wrong target cannot bring returns on your investment. You have to learn how to bring in your true target customers. No matter what type of accounts you have, you have to know that there are more than 3.5 million public accounts active on WeChat and the numbers are continuously growing fast. How can you secure your every post on their screens and then be read? Take one minute to think about your personal Twitter or Facebook account. Can you catch every post from your followings, just a glance on the headline? Your followers on WeChat are same as you on Facebook or Twitter. Don’t expect 10,000+ views of each of your posts unless you have grown a great number of followers and they actively share your every post. And only country level targeting is possible. It also asks for a minimum spending. If you are targeting users in U.S, the minimum spending is RMB50,000 (about C$10,000) for one campaign. If you are targeting users in Canada,it’s RMB10,000 (about C$2,000). WeChat only offers Pay-by-CPM because of concerns on the accuracy and then click-through rate. Furthermore, the placement of the feed ads can skip out target users easily. The feed ads are always placed on the fifth post. It causes two problems. One is that the users may not see the ads if he/she does not pull down enough. The other is that the ads will not be shown to the users if his/her friends don’t update the status frequently. And more frustrated, they keep pushing the ads to the same user anytime the user logs in, even after an interaction happened. Don’t forget that WeChat charges by CPM. During the CNY, Birks did this to attract Chinese tourists. We have kept a close look at the performance of the ads and have to say that the spending was wasted a lot. Same as PR marketing with traditional media like Ming Pao and Sing Tao Daily, many advertisers pay to media accounts on WeChat to write articles and push to their subscribers. Usually, the media would tell you they have tens of thousands subscribers in the region. But averagely, your articles have less than 3,000 views. And you have to pay from C$300 to C$2,000 for each, depending on the placement. Here are the reasons for the low reading. Too many subscribed public accounts. – Users usually subscribe to more than 10 public accounts and the media you use cannot reach them at the right time. – As what we said earlier, there are so many public accounts on WeChat and not every publication can reach the screens of all its subscribers. Same as those flyers delivered to your mail box, you usually throw them away without having a look. Long process to hit the ground. – It needs 3 steps for your paid article to reach the subscribers, if it is not on the first placement. – Only headline of the article on the first placement can hit the screen when users log into WeChat. If you do not buy the first position or your title is not attractive, they usually don’t click into it and your article has no chance to be viewed. If you are lucky that the first post is very attractive, the title of your article can be seen. Then you have a chance to be viewed if the user clicks on the title. No way to target users by demographics. – Advertising on these media is no difference as advertising on those conventional media because you cannot accurately target them by age, gender, or other demographics. If your contents are nothing to do with them, they will not give you a look at all. No way to target users by geo-location. – Almost all these media account are registered under the identities as businesses or individuals in China. Therefore, subscribers to these accounts are not all in Canada or your regions. They are only interested in hot topics instead of local business information. If you do hard sell there, your chance to be viewed is very low. In a recent case of Freedom55 Financial, they did a series paid article on a local WeChat account. Unfortunately, most of them has less than 1,000 views. One even has less than 500. With the money they paid, it deserves more than 20,000 views. The unit price of the displaying banner on these WeChat media may look small. It costs $30 to $100 each. But you have to buy from 10 insertions. If the effectiveness is not good enough, you cannot cancel it. 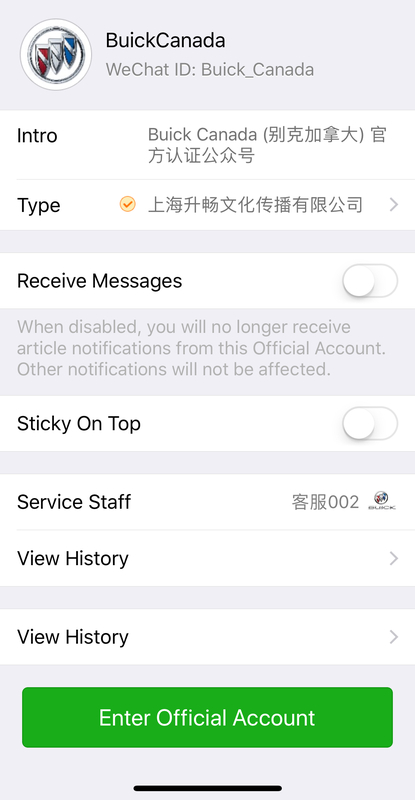 And usually the effectiveness of banners on WeChat is not good because of the few readings on the articles, the small size of the banner and less interactive functions. If you want to promote the traffics to your landing page, you cannot simply add a call-to-action button. You have to generate a QR code and add them to your key visual. Without a clear note to ask customers to extract the QR code to enter your page, it works nothing for you. In a survey we asked people if they know they can use that QR code to learn more information. More than 80% of respondents said they DON’T know what’s that for. If you have been using WeChat marketing and advertising, now you know why it doesn’t work well for you. But it’s not that bad for using WeChat as your marketing and advertising tools. You just need to sit down with someone who really knows about the marketing and advertising on Chinese social media. Let’s talk and sharpen your tools.